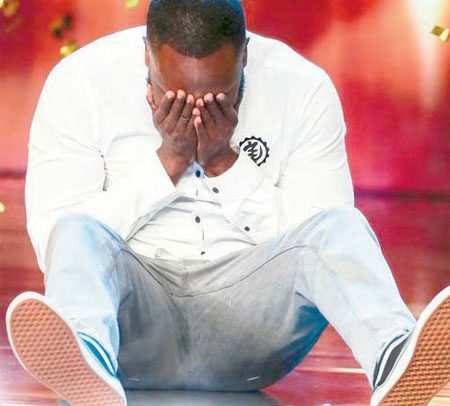 Kojo Anim, UK comedian of Ghanaian descent, gave an incredible performance on Britain’s Got Talent on Saturday night to the surprise of judges and fans of the reality show. Judge Simon Cowell laughed so much that he reached for the golden buzzer to qualify him to the semi-finals stage of the show. The father-of-one fell to the ground in tears at the news that he had been handed the music mogul’s safe seat, putting him directly through to the next round. Anim impressed the panel of Cowell, David Walliams, Amanda Holden and Alesha Dixon with a comedy routine which touched on class, black cabs, childhood and being a young parent. Following his routine, he received a standing ovation and four “yeses” from the panel. Walliams, the judge with the greatest stand-up experience, offered warm praise. “When someone is really funny there is nothing much to say apart from: ‘You are really funny’,” he said. Anim’s greatest compliment was yet to come as Cowell paused before addressing the comic on stage. “Kojo, I’m going to be really honest with you, I don’t really like comedians on this show,” he said. “But I love you,” he added, hitting the golden buzzer.